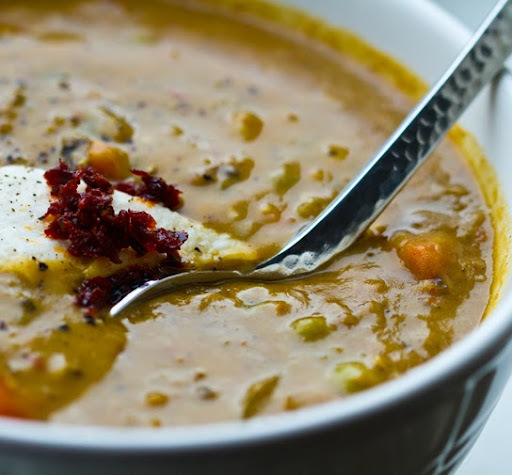 Spicy Harissa Split Pea Soup Recipe. Yay Winter! 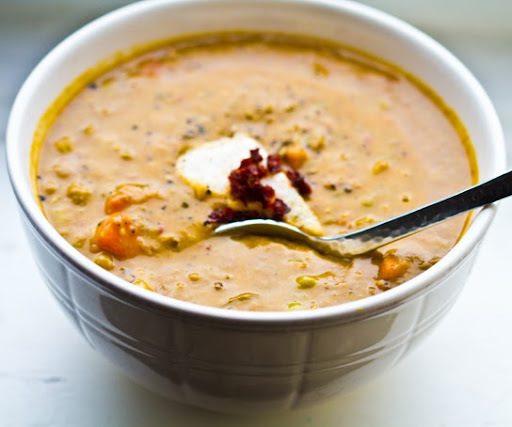 Have a cozy first day of winter with my Spicy Harissa Split Pea Soup! 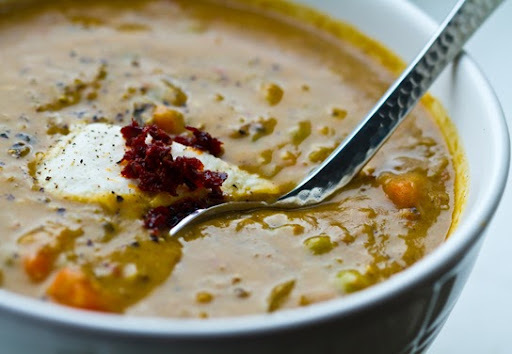 Simmer this soup and feel good about coming inside after a chilly winter day. I was frolicking all around town, Times Square and more!.. All I craved was a perfectly creamy, protein-rich soup to perk up my spirits. This soup hit the spot. Healthy Peas! 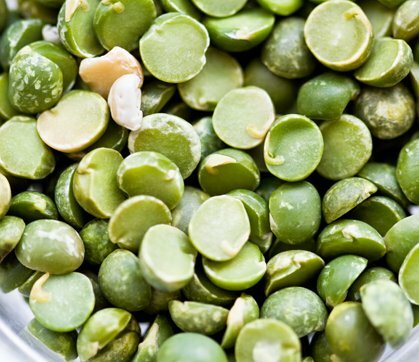 Peas have 2g fiber, 2g protein per half cup cooked! More pea nutrition facts. 1. 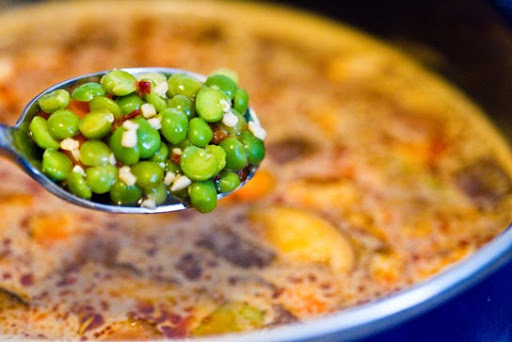 Soak peas in water for at least 4 hours - overnight will allows for quicker soup cooking. 2. 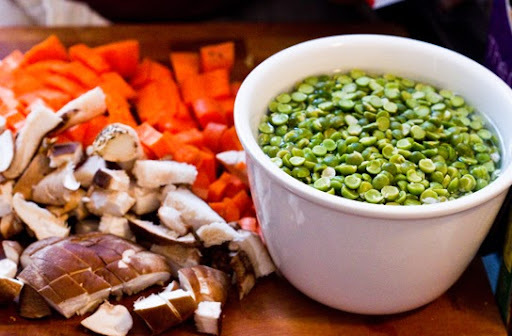 To a large soup pot add the carrots, mushrooms and garlic with a drizzle of EVOO. Saute for a few minutes. 3. Add in the remaining ingredients and bring soup to a boil. 4. Cover pot with lid and reduce heat to a simmer. Simmer for a few hours - or until the peas are tender. 5. 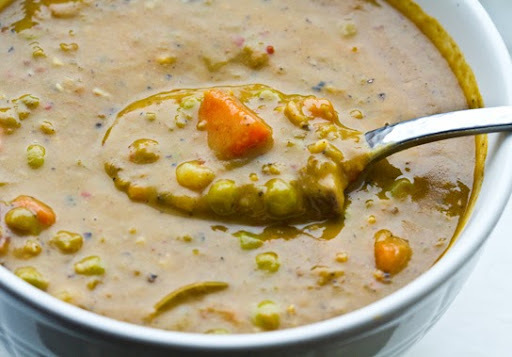 When soup is at the taste and texture you like you can add in the optional whole peas. For extra creamy soup, puree it in small batches before serving. 6. Remove bay leaves when soup is done. 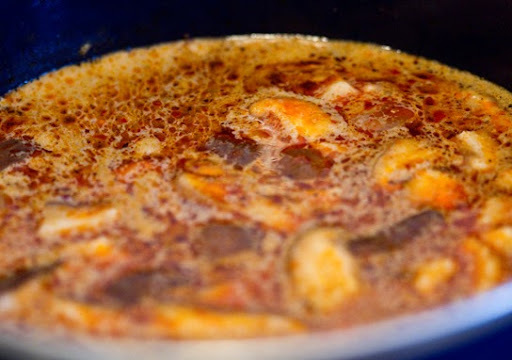 Serve hot and store in the fridge for up to a few days. Garnish with a dollop of harissa and a few chunks of vegan soy cheese. Note: be sure to turn the 'simmer' heat down to extra low. The last thing you want is a burnt bottom of soup to ruin the whole batch. Happy Soup Eating!! PS smoky Sweet Tempeh Croutons would be lovely atop this bowl of soup.